Argan oil has been a hot topic lately, especially when it comes to hair care products. But not many people are aware that argan oil could be fantastic for your skin as well. Whether you are trying to nourish heat-styled tresses or moisturize flaky, dry skin, Visible Science Organic Argan Oil may help improve the youthful look of your face and locks. 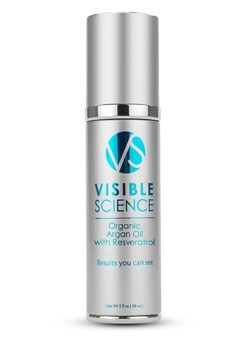 Visible Science Organic Argan Oil with Resveratrol may help give you glowing skin and healthy shiny hair. Argan oil has been a hot topic lately, especially when it comes to hair care products. But not many people are aware that argan oil might be fantastic for your skin as well. Whether you are trying to nourish heat-styled tresses or moisturize flaky, dry skin, argan oil may help improve the youthful look of your face and locks. And the organic nature of Visible Science Organic Argan Oil means that the active ingredients in its unique formula could be more quickly absorbed by your skin, without the greasy residue of synthetic argan products. For facial applications: Wash your face with your normal face wash. Pat dry using a soft towel. Take a small amount of Visible Science Organic Argan Oil and apply sparingly to your face and your neck. You may enhance the effects of Visible Science Organic Argan Oil by applying nightly after washing off your makeup with a gentle cleanser. For hair: For extra nourishing care for stressed hair, take a small amount of Visible Science Organic Argan Oil and apply to damp hair once you are out of the shower. Then style your hair as you normally would. To combat stubborn frizz or pesky fly-away hairs, a small amount of Visible Science Organic Argan Oil may smooth out your style and add shine. Argan oil is made from the seeds of the Moroccan argan tree. It is said to help restore hair's health and shine, while also helping to repair dry, damaged and flaky skin. Resveratrol is a unique addition to the Visible Science Organic Argan Oil formula that you might not find in many other argan oil products. Resveratrol is believed to be great for the skin due to its antioxidants. It may also help condition dry, damaged hair and help protect it from future damage. Linseed oil contains a high concentration of Alpha-Linoleic Acid, an essential nutrient. Linseed oil may also help repair damage associated with over-exposed skin and hair. Carrot seed oil is an important part of the Visible Science Organic Argan Oil formula. This age-old remedy for dry and chapped skin is also believed to rejuvenate damaged hair which has been excessively heat-styled or exposed to UV rays. This natural botanical extract packs a dual punch as it may help to heal stressed strands as well as repair damaged skin. It is also said to support a clear complexion, working to help reduce age spots and freckles. Customers may notice an improvement in their hair and skin after their first application of Visible Science Organic Argan Oil. The natural ingredients incorporated into the Visible Science Organic Argan Oil formula are gentle enough to be used on damaged hair, and also your face. Best of all, the special formula should not leave you with a thick, greasy feel!